Oatmeal Cookies: they're a classic! Be sure to try a sample batch of to test for dough spread, since the recipe calls for less flour than the usual drop cookie. This classic cookie recipe is super easy. It can be modified by adding raisins or nuts. And as an added bonus - they freeze well. Make extras to have on hand for lunches and snacks. In a medium bowl, combine flour, baking soda, salt, and cinnamon. Set aside. In a separate bowl, with an electric mixer on medium speed, cream together butter, granulated sugar, and brown sugar until smooth. Beat in eggs, one at a time. Stir in vanilla. Gradually stir in dry ingredients into creamed mixture until well blended. Mix in oats a little at a time until well incorporated into the dough. Add raisins and nuts (optional), combining them into the thick dough with a wooden spoon. Roll dough into walnut-sized balls. Place on greased cookie sheets 2 inches apart. Use the heel of your hand to lightly flatten each cookie. Bake for 8-10 minutes until cookies are lightly brown on the edges. Remove cookie sheets from the oven. Two kinds of oatmeal are used interchangeably in baking. Rolled oats (also called old-fashioned oats) are oats that are dried, toasted, hulled, steamed, and flattened. Quick oats (or quick-cooking oats) are rolled oats that are chopped and flattened further. Rolled oats give cookie dough a bumpier texture. Quick oats give cookie dough a smoother texture. Both can be used in oatmeal cookies. 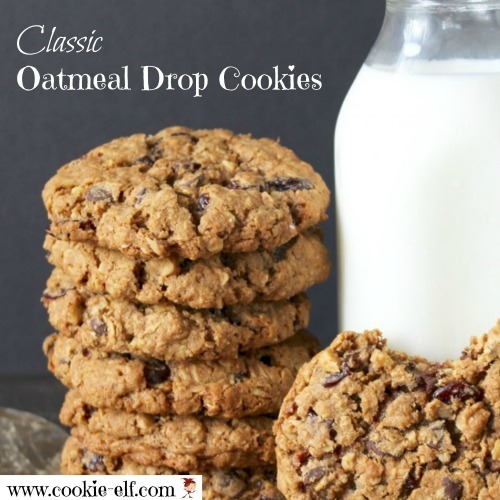 Get more idea on out Oatmeal Cookies Pinterest board.